A famous scenic tourist attraction in Jasper National Park, Maligne Lake, looks very different in winter when covered with snow. 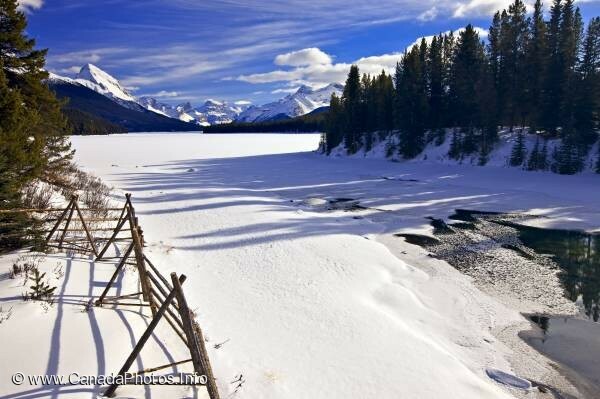 Partially frozen Maligne River and a wooden fence, during winter as the river drains from Maligne Lake, with a view towards Samson Peak (3077 metres/10095 feet), Maligne Lake Road, Jasper National Park, Canadian Rocky Mountains, Alberta, Canada. Jasper National Park forms part of the Canadian Rocky Mountain Parks UNESCO World Heritage Site.